This piece from the Placeshakers and Newsmakers blog gives some practical advice for how to do online engagement for planning projects. One huge takeaway is that you have to explain what the constraints on a project are. It’s easy for someone approaching your web site/tweet/facebook post to assume a blank sheet of paper. And that’s never the reality. It’s vital to create the proper context when soliciting community involvement online. But while I’m on the subject, I want to pass on my compliments to the Portland Plan team for their excellent use of online tools and social media throughout the Portland Plan process. I hope many of you can join us on April 18th when the plan goes before City Council (6pm, Council Chambers in City Hall). I’ve been following with interest a new development at Metro, an ‘optin’ public opinion panel. I signed up last week and would encourage you to as well. But it’s different. 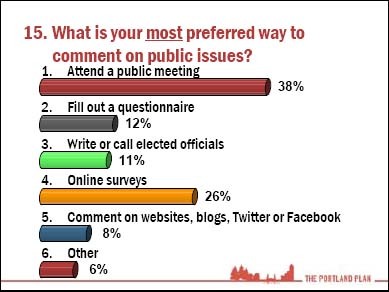 A public opinion panel is a different approach – as I understand the program it will attempt to pre-establish a large panel of folks who it is hoped will respond in the future (probably electronically) to some kind of survey instrument. If a sufficiently large base is built and is responsive then part of the benefit is to be able to create a respondent profile that is representative of the community, demographically, racially, age-wise, income-wise, etc. The opinion panel approach is likely to be more representative, but also more dispassionate (good and bad?). It also puts a lot of responsibility on whomever is writing and vetting the survey instruments. I don’t know yet how Metro is going to use the opinion panel, I suspect it will be an added input, not a replacement for the traditional process. I’ll look forward to seeing this experiment progress. Actually the whole Planning Commission is. In fact, this is the end of an era, as the Planning Commission that has advised Portland City Council since 1919 will be dissolved at the end of July. After a break in August, a new Planning and Sustainable Development Commission will be convened, and we’re going to need a few more folks. This change (as explained by Mayor Adams) catches up to the merger of the Bureau of Planning and the Office of Sustainable Development a year and a half ago. The new Commission will have 11 members (compared to 9 on the current Planning Commission). At the moment, it appears that all 8 serving Planning Commissioners will accept the invitation to serve on the new body, and one member of the Sustainable Development Commission (a joint City-County body, that is also being dissolved) will join us. That means it looks like there are going to be two open seats. You can apply at the ONI web site. Updated: First Portland Plan Background Data Hearing – Three? The PowerPoint presentation is now online. I both enjoyed tonight’s hearing and was disappointed by it. On the up side, the quality of the testimony was excellent, as was the Commission discussion during and after the testimony. The meeting began with a staff presentation on the highlights of the Portland Plan background reports. I’ll link to this presentation when it’s available on the web, it’s an excellent summary. Even though at a whole City level, we won’t need to up-zone to accommodate forecast growth, many citizens would be surprised by what today’s zoning code would allow to be built in their neighborhoods (a good reason to read the Urban Form Report). The hazard (earthquake, landslide, etc.) analysis in the background reports is not up-to-date and should be replaced with the current plans. The population and housing forecasts have changed dramatically over the course of the last two years and some citizens are skeptical about the numbers. This led to a discussion about Metro’s Urban Growth Report, which is the basis for the forecasts, and how a portion of regional growth is allocated to Portland. We also discussed that Portland Plan policies could impact this allocation. The Commission also had a lively discussion on factors influencing job growth. The second of the three hearings on the Portland Plan background reports will be at the February 9th meeting (a 12:30pm meeting, the hearing will be the second agenda item). Citizens are welcome to testify on any Portland Plan topic area at any of the hearings. Tell your friends, let’s have a crowd! The city-wide compilation of survey results from the seven Portland Plan workshops is now available online. Over 900 people attended the workshops. While they were NOT representative of the City as a whole (the attendees were less diverse and more affluent than the overall population), the input of 900 motivated citizens is always informative. Transit, walkability and access to greenspaces and trails scored high. You can still take the survey online! The Mayor has extended the deadline to March 31. A new flyer is available for the three Planning Commission Hearings on the “existing conditions” that will inform the Portland Plan. While each hearing has a topic, we want to be clear that citizens are welcome to discuss any Portland Plan issue at any one of the three hearings. And City Council won’t formally adopt existing condition findings until closer to the end of the year, so don’t panic! Keep the conversation going… the first hearing is January 26th at 6pm. One of the questions being polled at the Portland Plan workshops is the preferred way of providing input on public issues. 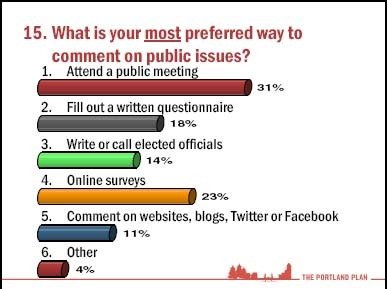 While it was no surprise that folks indicated that attending a public meeting was the favorite approach (after all, these folks were at a public meeting), I was a bit taken aback that the number two choice was completing an online survey. I have to admit that I’ve always found these a little bit constraining (you can’t very easily color outside the lines). What do you think about online surveys as a way to gather public input? Part of the mission of this blog is to make the City’s planning processes more transparent. I’m delighted that the Bureau of Planning and Sustainability has taken a step that is very complimentary to this goal, adding RSS feeds to the bureau web site. An RSS feed item is essentially a headline, usually accompanied by a one- or two-paragraphy summary (but sometimes by a whole article). Publishing these items as feeds lets user organize this information into categories and sets and visually scan them very quickly – much faster than having to do something like open and read an e-mail message. As a citizen trying to keep track of a lot of goings-on in both local government and national policy, it’s hard to keep up with the news. I find RSS feeds to be an invaluable tool to quickly scan what’s going on over a lot of fronts. I subscribe to more than 100 feeds. There’s no way I could keep track of all this information without the benefit of feeds. Here’s a nice summary of how feeds work from CNET. There are a variety of tools for reading feeds. I prefer web-based tools and currently use Google Reader, but you can find a tool that works with your favorite e-mail program, cell phone, or pretty much any device or environment you need. You’ll find information on events, meetings, document releases, calendars, programs and projects. Thanks to the staff that made this happen! I understand that a lot of it requires some manual tending, and I appreciate the effort that’s being made to make this information easier to consume. You are currently browsing the archives for the Citizen Involvement category.